Datacom’s Kapua datacentre near Hamilton has been quietly operating for a couple of months now, but the IT services firm hosted an official opening ceremony at its newest facility earlier this month. Datacom clients, local dignitaries and government officials including ICT Minister Amy Adams were treated to a tour of the building, including the data halls. It was probably the last time that anyone, other than security-cleared engineers and technicians, will get to see inside Kapua’s deepest recesses. The level of security is the first thing that hits you as a visitor. With its electric fences, prison-style gates, keypad entry systems and omnipresent security guards, you could be forgiven for thinking that Kapua was owned by the Department of Corrections. Datacom has even built a long earth bank to stop any vehicles that might stray, intentionally or otherwise, from a main road nearby. However these precautions do not seem unwarranted, considering what is and what will be housed at Kapua. The Tier 3+ datacentre is designed to house 920 racks in five data floors in the first stage of development, though there is scope for further expansion at the 11,000 square metre site. One data hall is in operation now but Datacom says enough clients have been signed up to fill a second data hall over the next several months. 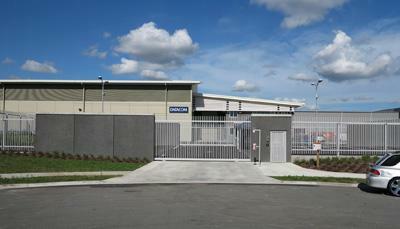 Tom Jacob, Datacom’s general manager of datacentres, says the design of the Kapua facility incorporates lessons learned from its Orbit datacentre in Auckland which opened in 2009. He says the two overarching design aims for Kapua were that it would be “fault tolerant and concurrently maintainable”. Fault tolerance has been provided by building in redundancy wherever possible. 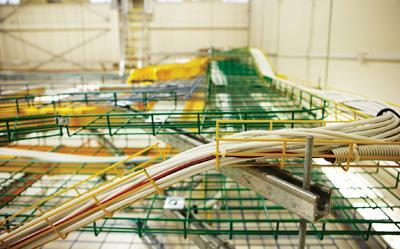 There are two physically separate sets of connections to the telcos and there are dual power supplies to all racks. 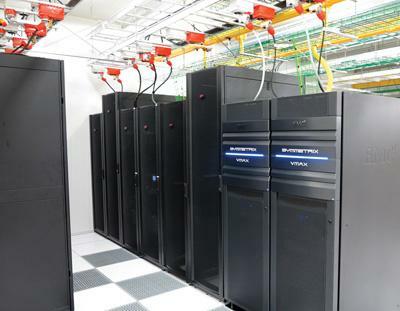 The power and cooling systems design caters for up to 5.8MW of power capability to the IT equipment. Should the power supply fail, one of two diesel generators will kick in to keep the UPS system charged. The generators, which resemble large marine engines, are rated at 1.8MW each. 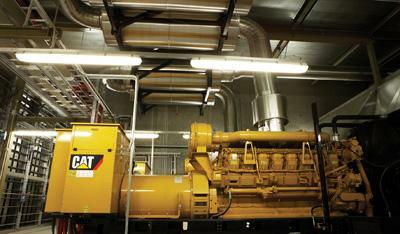 Datacom is storing enough fuel for at least 48 hours of generator operation but additional fuel stocks are on call. The diesel fuel in two separate tanks is “polished” in a continuous process to remove any water that is present, kill off bacteria and remove bacterial sludge. Jacob says that a double generator failure is highly unlikely, given that the generators and their fuel are well maintained. Similar attention to detail has been paid to the UPS system. A charging rack keeps a spare set of batteries in a charged state in case a UPS battery fails. Jacobs says that putting an uncharged battery into the UPS would degrade the whole system until the fresh battery had charged up, a process which would take about two days. “The aim is that we will never ask customers for an outage so that we can do maintenance,” says Jacob. Jacob says Kapua has a couple of further ‘selling points’ up its sleeve. The first of these is rack level billing based on kilowatt-hours used. “If a customer is using three racks, and only one is being used, the customer will only be billed for the electricity being used on one rack,” he says. Similarly, if a customer is able to run an application out of peak charge times, they will realise that saving in the power element of their bill from Datacom. But the ‘killer’ feature of Kapua is perhaps the Datacom-developed natural air cooling system, which means that the facility uses about 30 percent less power than the average datacentre, according to Jacobs. The cooling system draws in ‘cold’ air from the environment, mixes it with ‘hot’ air that has been warmed by the IT equipment and, after passing it through a series of filters, feeds it underneath the data floors. For example if the temperature outside on a chilly winter day is 10 degrees centigrade, that air will be mixed with enough warmed air, typically at 32 degrees, to achieve an optimum intake temperature of 21 degrees. The whole air management process, which involves banks of UPS-protected fans, intake vanes, pumps and cooling coils, is self-regulating and fully automatic. As the air is drawn in from the environment, it passes through an insect screen and a condensing system which removes any water particles caused by fog for example. Datacom has also installed a particle counter that can detect smoke from any fires in the vicinity, which would immediately cause the system to close its battery of air intake vanes. Datacom isn’t saying how much it spent on Kapua, but it says that Orbit and Kapua add up to a total investment of $90 million. The Kapua datacentre currently operates with 12 full-time staff including the security guards. The datacentre manager, Andrew Green is a Kiwi who returned to NZ (from Rackspace in the UK) for this job. Jacob says that all the Datacom staff employed on the site were initially located at the Orbit datacentre in Auckland (some for several months) for training and experience on the job before taking up the roles at Kapua. “We’d expect to grow the staff numbers at Kapua by another three in the next 12 months, and perhaps another four if the facility keeps on growing,” he says.